Track Conditions basically refers to the amount of moisture found in a Race Track. This can vary from being so dry that maintenance crews have to water the surface in order to hold the dust down, to wet enough that puddles of water appear on the racing surface. And of course everything in between. In this article we will define the various conditions for both Dirt and Turf surfaces, and provide examples of how they are presented in the Past Performances (PPs) of the Daily Racing Form. The following Table defines the various conditions for Dirt Tracks in North America. Fast fst Dry. Often times dry enough that it requires watering in-between races. Good gd A surface that is either drying out or has had recent, but not substantial rainfall. Muddy my A wet surface, that tends to be “deeper” and slower than a good surface. Sloppy sly A very wet surface, covered in water, often with puddles visible. The rain might still be coming down, or have stopped – but the drying process has not yet begun. Wet-Fast wf A wet surface, but with only a thin layer of water on the top, and the moisture has not penetrated deeply into the lower layers. 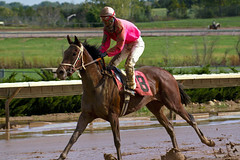 The following example shows some of the various conditions for a horse that has run over dirt tracks. Notice the race on Sep 23, the condition of “sly” has a superscript ‘S’ at the end of it. This means the track was “sealed” by the maintenance crew. Sealing a track is when weights are dragged over the surface to compact it down, and causing new rainfall to flow off the track and not penetrate into the lower layers. This generally will allow the surface to return to “fast” or “good” conditions quicker than if the rain soaked deep into the track. The following Table defines the various conditions for Turf Courses in North America. Firm fm A turf course with minimal moisture, and a slight give to the surface. Good gd A turf course with some moisture, and more give than a firm course. Soft sf A turf course with more moisture than a good course, and significant give. Yielding yl A very wet turf course, with substantial give. Heavy hy The most wet turf course, basically waterlogged. Very unusual in North America, because when conditions are that bad, the race will nearly always get moved to the Main Track. This is a good example of a horse that has run on the majority of turf conditions. The only one missing is “heavy,” and is very rare for reasons explained above. As you will see in later posts, not only do some horses prefer turf over dirt tracks, but some horses prefer specific types of turf courses. If you hear a trainer say that their horse likes “some cut” in the ground, he means the horse prefers turf courses with a little give to them. Other horses hate to run on anything but a super firm course, or one like “concrete” as referred to by trainers and fans. As you will learn in later posts, there are numerous handicapping theories and angles built upon the various track conditions. Some are focused on the condition of the track today, while others look to excuse a poor performance by a horse on a less than favored surface in the past. What are possible conditions for a synthetic track? Good question. Due to the nature of Synthetic tracks, and their ability to absorb large amounts of moisture, their track condition is always shown as “Fast” in the Daily Racing Form. I believe they can be downgraded to conditions similar to dirt tracks, but I’ve never seen anything but Fast. This is by far the best list of useful information I’ve been able to find on the net. Mr. Benoit’s explanation are just what I’ve needed to perfect my handicapping. The only thing missing is the symbols for track surface designation, ie; synthetic, dirt, or? I know they are shown but which symbol is which? ( forget turf)..Thanks again.. If it rains on Friday and the track is sloppy but does not rain the following day on Saturday, how long does it take the track to become firm? My previous question relates to yesterday’s Black Eyed Susan with rain and a sloppy track on Friday, May 19, 2017 at Pimlico in Baltimore, Maryland. The forecast calls for no rain Saturday, the next day, for the Preakness. If it doesn’t rain, what kind of track could be expected by 6:48 pm ET for the 13th race? Classic Empire finished 4th in the Kentucky Derby on a sloppy track but seems to finish strong on fast tracks. in thoroughbred racing when they seal the track due to rain, is the surface harder or softer than on a normal day? I believe it’s harder since the surface is packed down during the sealing process. On a “normal” day the surface would be harrowed and therefore have more give to it.